At last the mystery surrounding Western badman Lee Roberts’ birth and death has been solved. He was born Robert R. Allen June 17, 1913, in Ohio. His mother’s maiden name was Simpkinson. His father is not listed in the California death records. 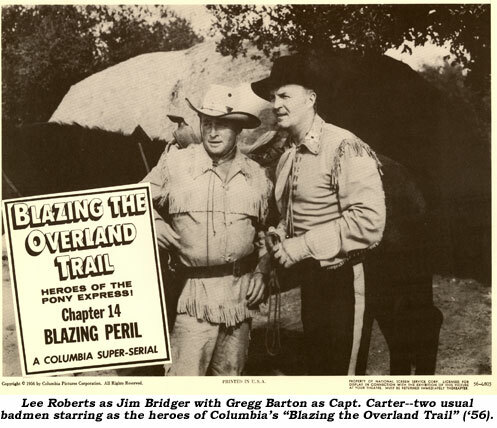 After completing only two years of high school, it’s not known what he did during his early years but he came to movies in The Trail Blazers’ “Blazing Guns” in 1943. 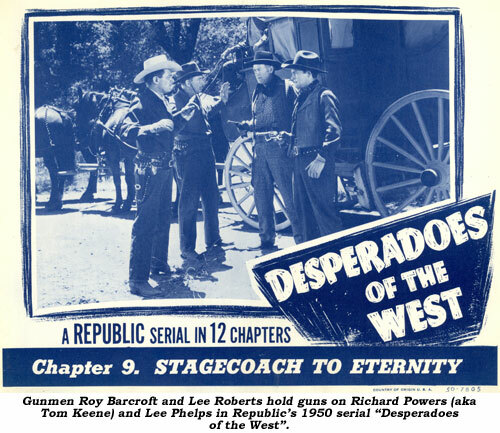 He was also in their “Death Valley Rangers” and “Outlaw Trail” as well as a bit in Republic’s “Masked Marvel” serial before enlistment in the Army on February 14, 1945, at San Pedro, CA. His enlistment records indicate he was married at the time. 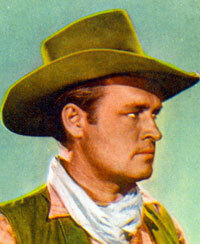 Discharged by ‘46, he was back in westerns with Universal’s “Scarlet Horseman” serial and several Eddie Dean Bs. 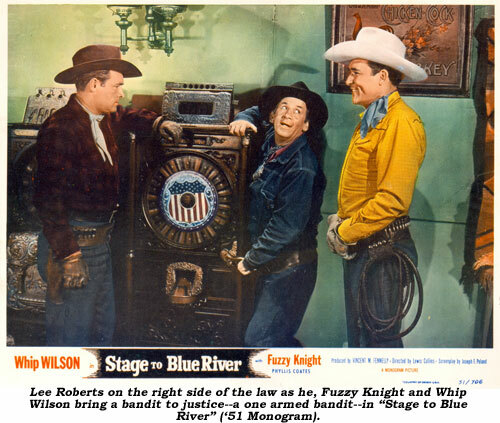 Usually he was one of the gang out to rustle, steal or swindle, but on occasion he moved up to second lead with Whip Wilson (“Stage To Blue River” ‘51 Monogram, “Riders of the Dusk” ‘49 Monogram), Eddie Dean (“Stars Over Texas” ‘46 PRC), Johnny Mack Brown (“Canyon Ambush” ‘52 Monogram) and Sunset Carson (“Battling Marshal” ‘50 Yucca). 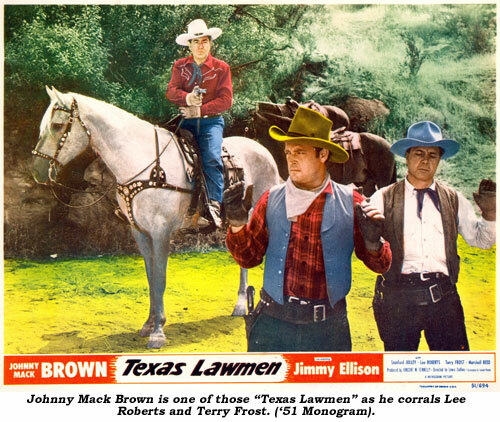 Lee’s one chance at stardom came late in the game when Sam Katzman selected him as Tom Bridger, the lead for his “Blazing the Overland Trail” ‘56 Columbia serial, dressing Roberts to match stock footage of Buck Jones from earlier Columbia serials, “White Eagle” in particular. It was the last serial ever made. Incidentally, Lee was a henchman in Republic’s last serial, “King of the Carnival” in ‘55. 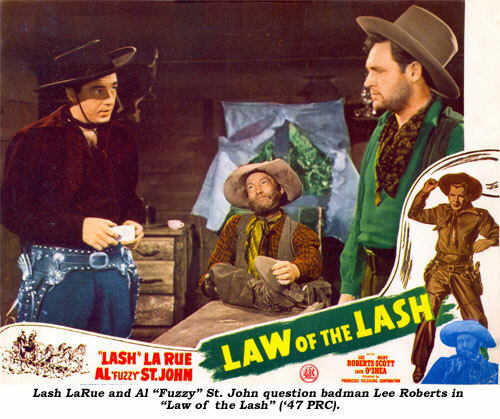 Roberts was in 14 serials, with good roles also in “Pirates of the High Seas” (‘50), “Great Adventures of Capt. Kidd” (‘53), “Lost Planet” (‘53) and “Adventures of Captain Africa” (‘55). 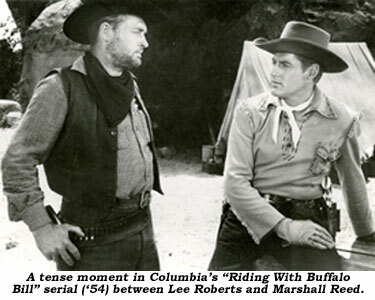 Roles in film and on TV were minimal after the serial and by ‘61 Roberts had disappeared. He was last seen on a few episodes of ZIV TV’s syndicated “McKenzie’s Raiders”, a “Laramie” in 1960—“Hour After Dawn” and as a bus driver in a ‘61 episode of “Route 66”.